Before, people used keys, codes, and cards. Now "Your finger is the key". Imagine, using a finger to control access to security systems, gates, wine cellars, offices.....imagine the possibilites. 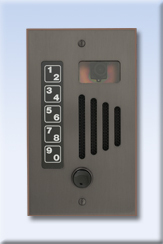 Holovision Model 101 Intercom and Essex Keyless Entry System. Model 101 includes back box, speaker-microphone bracket ,Essex keypad, Essex 265 controller, power supply, gasket, and instructions. Model 101-TES (Holovision’s Telephone Entry System) Allows communication between the door or gate and every telephone in the home. The system causes all of the phones in the home to ring with a distinctive ring tone. 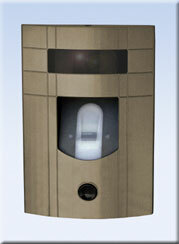 Includes speaker, microphone, and all other components for a complete entry system. Optional door strike relay is available. Model 101-VIK (High performance Viking system) System uses “half-duplex” communication, allowing for high speaker and microphone volume, without the possibility of feedback. Holovision Model 201 Intercom, Essex Keyless Entry System and Camera! All of the 200 Series faceplates feature high resolution cameras with adjustable swivel mounting, Black and white cameras are standard in the 200 Series. Camera options include high resolution color cameras from Sony, featuring the Sony ExView CCD chip. 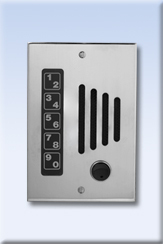 Holovision Model 100 Intercom/Doorbell Station. 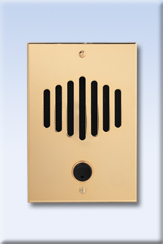 The 100 Series faceplates have been a standard in the industry since 1990. Although they may look the same, the product improvements never stop. The most important of these improvements is the doorbell button, Our decorative button with the brass bezel has reduced call backs for defective buttons by 95 per cent! "We Bring Your Home to Life!